Oh guys! It’s here. 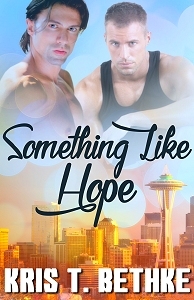 Something Like Hope is out! Right now you can get it directly from Amber Quill and when other places become available I’ll update with links. In the meantime, how does an excerpt sound? I got to the set at three minutes after seven the next morning, and when I saw the Camaro in the parking lot, I moved quickly. I walked straight to Lucas’ dressing room. The door was cracked open, and I could hear the soft strains of some 80’s rock ballad. I didn’t knock, didn’t ask for permission, just walked in the room and shut the door quietly behind me. It took him a second to realize I was there. When he did his face lit up with a grin, before a scowl quickly took its place. I weighed that for a long moment, really thinking it over. It had to be a good thing that he was inviting me over. He must finally be ready to talk, and I took that as a good sign. As I stood there studying his face, I saw something like hope in his eyes. He was a terribly confusing individual, and I didn’t understand anything about him or his motivation. But there was only one way to find out. “Okay, yeah. I’ll come by tonight.” I hadn’t taken my gaze off him, and I did not miss that brief flash of relief that crossed his face. “Um. All right.” Lucas looked disappointed, but he dutifully rattled off his cell number for me to put in my phone. I quickly shot him a text, a smiley face, so he would have my number as well. That concluded, we both stood there, awkwardly staring at each other. I broke first, laughing at the situation. Lucas’ smile was sheepish, and he shook his head. “I’ve got to go to makeup,” he murmured. Lucas admits his attraction for Aaron, but he is reluctant to act on his desires because of the potential detriment to his career should his sexuality become public. What they have between them could be sizzling hot, but is it worth the risks? Thank you lots and lots sir! YAY!!!! Happy Release Day, Kris!